On May 12, 7-9pm, a special seminar was held at L’Institut Franco-Japonais de Tokyo, sponsored by the Delegation Office of Quebec Government to discuss what Japan can learn from Quebec for the purpose of promoting Japan-Quebec relations. After a brief introductory address was given by Mr. Marc Beliveau on behalf of Representative Suzanne Ethier of the Delegation Office of Quebec Government, Tokyo, interesting presentations were made by three specialists on Quebec, Prof. Yoshikazu Obata (Meiji University) in literature and culture, Prof. Shuji Sota (Atomi Gakuen University) in art management, and Mr. Mitsuhisa Ikeuchi (Corporate Advisor and College Lecturer) in economic affairs, moderated by Takahiro Miyao, who is the author of the Japan-Quebec Blog (http://japanquebec.blog76.fc2.com/). 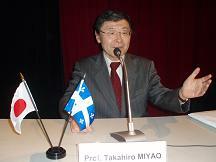 First, Prof. Obata explained the historical and spiritual background of people in Quebec with special reference to the song, entitled “Gens du Pays” (meaning “people of the nation”). This song has been widely sung by people in Quebec on festive occasions and helping their search for “national” identity for the last few decades, according to Prof. Obata. 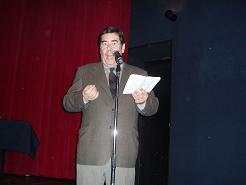 Second, Prof. Sota pointed out the unique characteristics of Quebec-style performing arts, as represented by La la la Human Steps and Cirque du Soleil, where not only their artistic quality is first-rate, but also their management system, including production and distribution, is excellent from the business point of view. This is something that Japan can learn from Quebec for acquiring a more open and global perspective in artistic activities including management aspects, according to Prof. Sota. Third, Mr. Ikeuchi talked about the economic development of Quebec with special emphasis on the effects of its language-cultural policies. He concluded that Quebec’s language policy has benefited its economy after all, because it helped Quebecois obtain their identity and self-confidence so that many French-speaking professionals have been attracted to Quebec, especially Montreal and Quebec City, to work for internationally competitive industries. 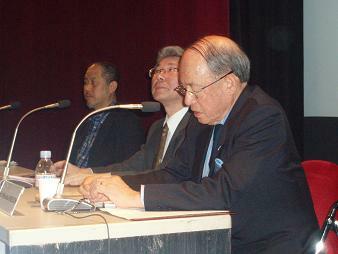 Finally, a free discussion involving the audience took place, and many questions were asked about Japan-Quebec relations. Also there was an announcement that an introductory book about Quebec in Japanese will be published by the end of this year. Hopefully, another seminar like this one will be organized in the near future, so that we can discuss further how to improve Japan-Quebec relations. On April 28, I visited Prof. Hidehiro Tachibana and asked him about his thoughts on Quebec at his Waseda University office, filled with books on French language, literature and culture in Japanese as well as in French. Since I know little about France or French, I felt somewhat awkward at the beginning of my interview, but then I found Prof. Tachibana’s messages quite clear and straightforward, and became relaxed as the interview went on. The first message of Prof. Tachibana was that, for understanding the importance of the French language, we should focus not only on France alone, but also on a variety of countries and regions in the world, where French is being spoken, as represented at the annual Francophonie Festival. In this regard, Quebec is a very interesting region, where some traditional expressions of French (original French in the 16-17th centries) are still alive, and the language has been playing a crucial role in forming their identity in the isolated environment without going through the revolution as in their mother country. 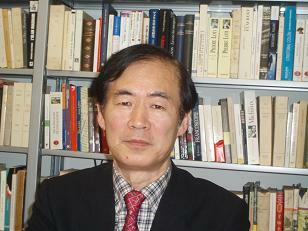 To study this further, Prof. Tachibana recommended a recent book on “Comparisons of Nations and Cultures of the New World,” written by Quebec historian Gerard Bouchard and translated into Japanese by Prof. Tachibana and his colleagues (http://www.hanmoto.com/bd/isbn978-4-7791-1241-6.html/). His second message was about lessons that Japan can learn from Quebec. He said he was very impressed with the recent revival of Quebec Province, which has shown its vitality in economic, cultural and other fields, after achieving social stability within Quebec for the last couple of decades. Unlike their turmoil years in the 60s and 70s, the Province has recently been attracting and educating a variety of excellent French speaking individuals in arts, science, high-technology, etc., and also adopting and succeeding in its controversial language policy, resulting in the establishment of Quebec, especially the city of Montreal, as one of the main economic and cultural centers in Canada as well as in North America. What Japan can learn from Quebec is exactly the spirit of independence and determination shown in adopting their unique language-culture policy, which has enabled Quebec to be open to the surrounding English-speaking world, however strong they seem, for coexistence and mutual prosperity, whereas Japan has been somewhat stagnant not only economically , but also mentally, and becoming inward-looking for the last couple of decades. In order to reverse these trends, there may be some lessons in the Quebec experience for Japan, according to Prof. Tachibana. His last message in response to my question of what we should do to promote Quebec-Japan relations was that we need to interact with each other more often, if possible, on a daily basis to discover something similar or different in each others’ daily lives for mutual understanding. For that purpose, we should encourage “online communication” in addition to regular tourism among the general public and regular exchange programs among students and scholars between Quebec and Japan. Hopefully, this kind of blog activity can contribute to that end.